Dynastic musical families are far from rare. Grove lists no less than 283 of them, and that doesn't include such as the Sweelincks who, through each generation, changed the family name. Of course, the most numerous musical dynasties were in the 17th and 18th centuries, and while not all matched the Bachs in sheer numbers of musicians in the family (Grove considers 14 to be of sufficient worth to warrant individual entries), many ran them close; the Benda family (12), the Couperins (10), the Webers (9) and the Scarlattis (8). Even the Mozarts bred sufficient members to warrant six individual entries in Grove. For children to follow in their father's footsteps was much more common in an age before a broad-based education system and transparency in professional appointments opened up the job market allowing families to spread across the professions; my father, for example, was a civil servant, my brother an oil company executive, one of my sisters a teacher and myself a musician. Indeed, there is almost something suspicious today when a son follows in the career footsteps of a high-profile father. My own father still gets very angry when either David or Jonathan Dimbleby appear on television, assuming that they only reached their eminent positions because of their father Richard's pioneering role in the early days of BBC television. For him, who achieved high office in his career through his own efforts (and possibly through an exceptional standard of integrity), any hint of nepotism is utterly despicable. It is inevitable, however, that when a father's occupation so fully involves his life that it is impossible to distinguish between work and family, his children will be more inclined to follow in his footsteps. I think of son-following-father situations such as Lucian and Andrew Nethsingha, both of whom were English cathedral organists, Lennox and Michael Berkeley, both of whom were composers, and of course Neeme Järvi and his two sons, Paavo and Kristjan, all eminent conductors. Less common are families who have kept within a single profession but have spread out within it to perform various roles, and by a funny coincidence, the two that spring most readily to mind are Indian. The great sitar virtuoso, Ravi Shankar, has fathered two daughters one of which, Anoushka, has followed him into the world of Indian Classical Music while the other, as Norah Jones, has carved out a career in a totally different genre, standing as one of the big vocal artistes in western pop music. The other family is the Mehtas. As a student I first encountered conductor Zubin Mehta when he ran a conducting masterclass. I was inspired by his work and while it showed me that I was not cut out to be a conductor, the morsels of information I picked up from him then have stood me in remarkably good stead throughout my subsequent, mostly non-conducting career. Last year I found myself on a discussion panel with his brother, Zarin Mehta, director of the New York Philharmonic Orchestra, a wonderful man whose vast reserve of common sense and piercing logic were as inspiring to me as the eminently practical advice gleaned from his brother. Then, on my frequent visits to India, the name of their father, Mehli Mehta keeps cropping up. He it was who founded the Bombay Symphony Orchestra and whose pioneering work did so much to ignite the passion for western classical music I have found in India; indeed, one of my best students at the moment is an Indian boy who would never have had the doors of a musical education opened so generously to him had it not been for Mehta's pioneering work. Then, just yesterday, a disc for review dropped through the door starring yet another Mehta, Bejun. 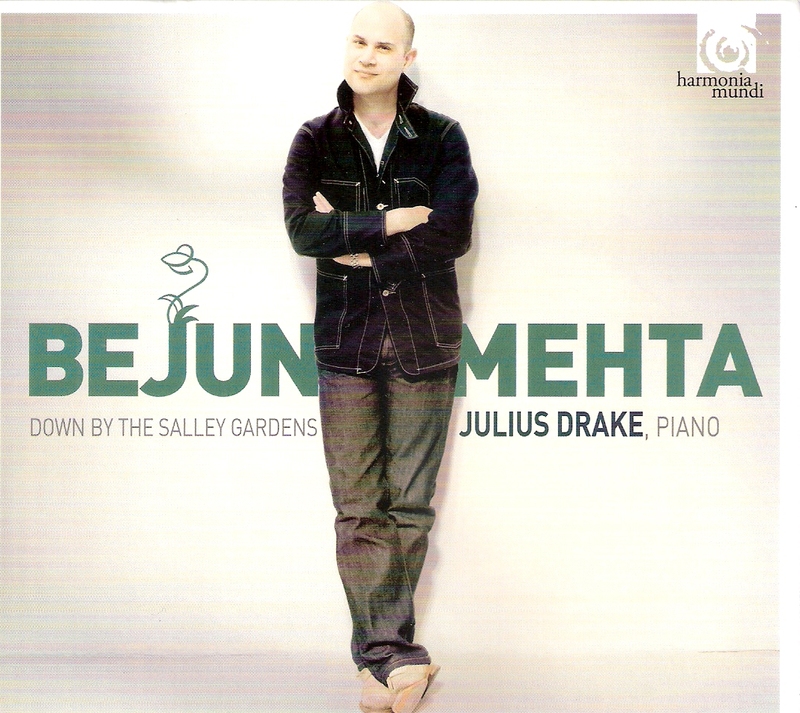 Embarrassingly I have to confess that I had never heard of him before, yet I read from his agent's website that "Bejun Mehta has been regarded for a long time as the most impressive countertenor worldwide, both vocally and dramatically". What's gone wrong? How come I, who should be more aware of the great stars of the concert platform than most, was so ignorant? Frantic researches found that he was none other than a nephew of Zubin and Zarin, while his own father, Dady Mehta, was a pianist of whom, somewhere in the dark recesses of my mind, I had heard. There can be no hint of patronage or nepotism here, not least because the kind of music countertenors normally sing is not the kind Zubin ever conducts or Zarin's orchestra ever performs. I would add, too, that countertenors and pianos are not that common in combination, which would rule out influence from Dady, except that the disc I had for review was a recital of 20th Century English Song performed by Bejun accompanied by a piano, the matchless accompanist, Julius Drake doing the honours. I'd love to report that, having heard him now in repertoire which is very, very, very close to my heart, I am even more appalled that his name has not impinged on my consciousness before but, sadly, I can't say the recording bowled me over. Indeed, while I admire his voice, after a while I found his method of performing this music vaguely irritating. Check out my review on www.theclassicalreview.com. Not all members of musical dynasties can be expected to be uniformly excellent, but I will not take my disappointing initial experience of Bejun as a real indicator of his talent; his ancestry is too impressive for that. Instead I shall root out some of his opera recordings, many of which seem to have encouraged some enthusiasm from the world's critics impressed by his individual excellence, rather than his family ties. HI MARC! Thank you for your blog and I truly enjoy your it. I haven't had the opportunity to hear Bejun in this new cd, but I had the opportunity to hear him in Tommaso Traetta’s Antigona in the role of Emone. He was vocally and dramatically very effective and being a big fan of countertenors, he is indeed one of the best I have seen and heard. I got to know him through his first CD, and nothing could have prepared me for his wonderful performance. It is amazing to see this transformation from a boy soprano to a countertenor. Thanks for that, and I'll certainly chase up on what you suggest. I love the countertenor voice but I'm not sure it works in Finzi, Howells, Quilter et al. By the way you cannot have a boy soprano - that's a transvestite voice - it's a treble. CHeers! Of course you have boy sopranos. They're the ones who grow up to be ladyboys!! !